It may not be a very good season for the Orix Buffaloes, currently in last place in the NPB Pacific League. Still, they got the attention of the media when the first ever player developed in Italy to perform in the Japanese Big Leagues earned them a win. Alessandro Maestri (27) went 6.1 innings allowing only 1 run on 4 hits as the Buffaloes defeated (5-1) the Chiba Lotte Marines on Sunday 8/12. A smiling Maestri took an Italian flag on stage for the post game interview and said he could not possibly anticipate a better debut: "I could throw all of my pitches for strikes today. A lot of the credit goes to catcher Itoh for his guidance". 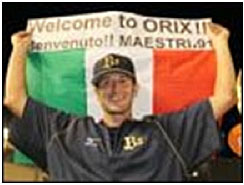 Maestri was greeted by banners in Italian (stating "Forza", something like let's go) by his fans and welcomed at the end of the game his older brother, who flew all the way from Italy to watch him pitch: "My brother made me pick the game, when we were kids. I used to do every thing he did...". The japanese press disclosed that Maestri will make US $ 30,000 from July to the end of the season and got curious about the fact the Italian pitcher took the mound with a glove he bought in Chinese Taipei for 65 US $ and that would be worth at least 350 in Japan.